The Honourable Matthew Cheung, Secretary for Labour and Welfare of the Hong Kong Special Administrative Region, today (6 May) emphasised the Hong Kong Jockey Club’s instrumental role in “augmenting, supplementing and complementing the government’s efforts in building a more caring compassionate and cohesive society.” Mr Cheung was addressing delegates from around the world during the 35th Asian Racing Conference in Hong Kong. The Hon Matthew Cheung Kin-chung, Secretary for Labour and Welfare of the Hong Kong Special Administrative Region, delivers a speech in the conference’s plenary session “The Community Impact” of horse racing today. At the plenary session examining ‘The Community Impact’ of horseracing, Mr Cheung delivered a presentation entitled ‘The Role of the Hong Kong Jockey Club in Building a Caring Society’. While highlighting the rapid social changes that are occurring in Hong Kong, particularly the demographic concerns attendant to an aging population, Mr Cheung drew attention to HKJC’s close collaboration with the government and the non-governmental organisation (NGO) sector in working to devise long-term solutions to evolving welfare demands. With government expenditure on social welfare set to reach HK$57 billion in 2014/15, representing 18.5% of the Hong Kong government’s total recurrent expenditure, Mr Cheung applauded the Jockey Club Charities Trust, which has donated an average of more than HK$1.3 billion to the community every year over the past decade by way of its own initiatives and donations, supporting the projects of over 100 charitable groups and organisations each year, encompassing initiatives on community services, education and training, health, culture and sports. "It is no exaggerating to say that the logo of the Hong Kong Jockey Club is omnipresent in Hong Kong," Mr Cheung remarked. Mr Cheung told delegates that the Jockey Club not only generates substantial and stable tax revenue for the government, it also creates considerable job opportunities and serves as a major charitable benefactor. He said: “The Hong Kong Jockey Club has weaved itself into the local social fabric and has established itself as a beacon of charity and a key fountain of funding for worthy community projects in Hong Kong. The range and diversity of these projects amply reflect the Jockey Club’s commitment to contributing to this city’s long-term social development. “In short, the Jockey Club is far more than a powerhouse of horse racing of international standing. It is an important social engine generating immense horse power to propel the long-term social development of Hong Kong,” Mr Cheung highlighted. During the same session, a keynote speech by the Honourable John Brumby, former Premier of the State of Victoria in Australia, outlined “racing’s capacity to make a significant contribution to public revenues, employment, economy and society” in his address entitled ‘Racing and Major Events: a Governmental Perspective’. 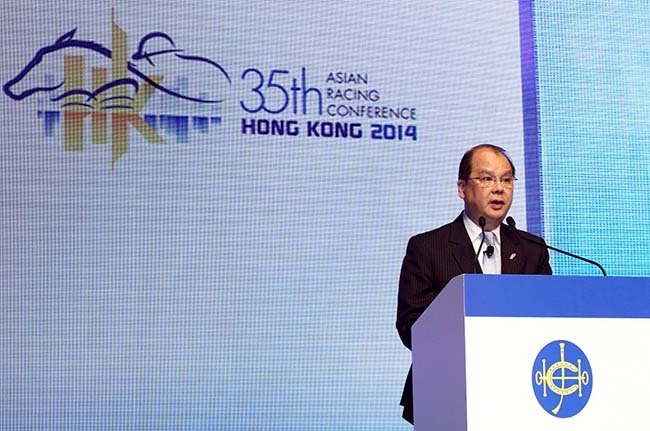 He noted that in Japan, the Japan Racing Association contributes 10% of its turnover and half of any surplus profit, which in 2013 amounted to US$2.5 billion. In addition, the JRA generated US$57 million in 2011 to help the people and communities affected by the Japanese earthquake and tsunami. Mr Brumby also pointed out that in Hong Kong, the Jockey Club is the largest single taxpayer, responsible for 7.4% of fiscal receipts in 2012/13, and on top of this the HKJC made a total HK$1.95 billion contribution to charity in that year. Turning his attention to the importance of major horseracing events to tourism, Mr Brumby noted that in 2012, the Melbourne Spring Carnival attracted an overall attendance of 706,840 people. “Of the 700,000 attendees, almost one in four were from interstate or overseas and many of these people travelled to Melbourne solely for the event; the same tourism impact from racing can also be seen in other countries. In Vintage Crop’s country of origin, an estimated 80,000 people a year travel to Ireland to go racing. Here in Hong Kong, a Wednesday night at Happy Valley is a major tourist drawcard,” he said. In conclusion, the former premier of Victoria suggested that “it has always been my view that a prosperous and responsible racing industry is an important element of civil society. If I am asked to sum up its community impact I would say it is overwhelmingly a beneficial one. Dr Alan Jackson, a highly successful international management consultant and businessman, who has also held several positions of authority in the racing world, delivered a presentation entitled ‘A Possible Model to Generate Economic Surplus’.